BROOKINGS, S.D. – The adult wheat stem maggots have been observed in winter wheat fields across South Dakota. However, experts from SDSU Extension, North Dakota and Nebraska say chemical management is not recommended. Wheat that is damaged by the wheat stem maggot results in a white/dry head and stem to the first node where the flag leaf is attached. Researchers at SDSU Extension are working collaboratively with researchers from North Dakota and Nebraska to determine peak wheat stem maggot adult flights. Are wheat stem maggots in your fields? 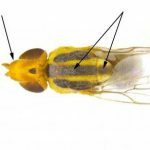 The wheat stem maggot adults are small yellow flies about one-fifth of an inch long with bright green eyes. Adults have three black stripes present on their thorax, with the middle stripe longer than the other two (Figure 1). Adults also have a segment on their head that extends forward beyond the eyes. Adults of the wheat stem maggot are nectar feeders and lay eggs on the leaves and stems of wheat plants. “Magnification may be required for identification,” Varenhorst said. When the eggs hatch, the larvae burrow into the stem and begin feeding near the flag leaf. This feeding prevents nutrient flow to the head. A larger concern is that in 2017, wheat stem maggot feeding caused significant stand loss to corn fields in Nebraska. Researchers are working to determine the factors that contributed these unusual infestations.